Public sector finances are tight. Social Impact Bonds promise to encourage innovation in public services without the risk of paying for failure. Faced with the growing challenge of addressing complex and costly social problems at the same time as reducing Government spending, Civil servants in a number of departments, together with their counterparts in local government, are exploring new and innovative ways to finance and deliver public services. This includes looking beyond the tools and levers traditionally available, and bringing new players into policy making and service delivery. Social Impact Bonds (SIBs) have become a particular area of focus, attracting interest among politicians, investors and service providers, both in the UK and around the world. At its simplest, a SIB is a way of financing a Payment by Results (PbR) contract. Under a PbR contract, Government agrees to pay a service provider if – and only if – it achieves certain agreed results. This means that the service provider must cover the initial costs of delivering services. Many potential providers find this difficult, particularly social enterprises and charities, as they often do not have the capital available to provide services in advance of being paid. 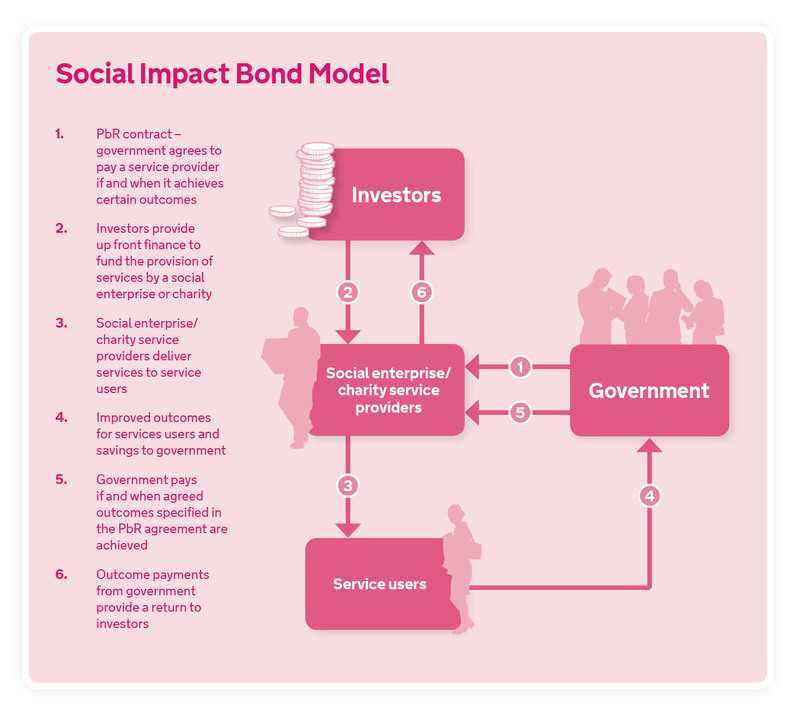 A SIB is a way to bridge this gap, enabling socially-minded investors to fund the provision of a service delivered by a social enterprise or charity on the basis that they will receive a return on their investment from Government – if the service delivers the results specified in the PbR agreement. SIBs are an opportunity for the Civil Service to rethink the way limited resources are used to tackle complex and expensive social problems that Government has previously struggled to solve. In particular, the policy makers and commissioners of public services who are testing SIBs see them as a mechanism to drive innovation in public services by shifting the focus of commissioning towards outcomes. This allows service providers to design interventions based on their expertise and experience of dealing with specific groups or tackling social problems, focusing on what works rather than being constrained by systems and processes imposed by commissioners. By expanding the sources of investment and making finance available to a wider range of organisations, SIBs also have the potential to increase the diversity of organisations able to deliver services, enabling social enterprises and charities to deliver PbR contracts. This can bring greater levels of innovation, expertise and specialism into the delivery of services, especially in areas where people using those services are marginalised or hard to reach. Because SIBs focus providers on achieving outcomes and only pay for interventions that succeed, they may help improve performance and reduce costs. Finally, the external investment that SIBs generate can also be used to fund preventative services that can reduce demand for more expensive remedial services and generate more sustainable public services in the longer term. "By aligning the interests of key stakeholders around social outcomes, Social Impact Bonds have huge potential to significantly increase investment in effectively tackling social issues. They are also powerful in addressing preventative care that directly impacts on health and social costs." The first SIB was developed by Social Finance, a not-for-profit organisation that supports charities and social enterprises to access finance, working with a Civil Service team in the Ministry of Justice (MoJ). Launched in September 2010, it aimed to reduce reoffending among short-sentence prisoners released from Peterborough prison. Social Finance raised a total of £5 million from 17 social investors to fund experienced social sector organisations such as the St Giles Trust (a charity that supports ex-offenders with housing, education, training and employment) to provide intensive support to 3,000 male short-sentence prisoners inside prison and help them resettle in the community after release. The MoJ and the Big Lottery Fund will repay investors if there is a reduction in reconviction rates of seven-and-a-half percent or more compared to a control group of similar short-sentence prisoners who have not received any support after release. Returns to investors are linked to the percentage decrease in the reconviction rate and are capped at 13 percent. The Peterborough SIB has attracted considerable international attention as an original policy experiment. The first full results will not be available until summer 2014, but very early results released by MoJ in June show that the SIB has led to a decline in the frequency of reconvictions of six percent compared to a 14 percent increase nationally. If those results are confirmed they would provide compelling evidence that SIB-based interventions could play a key role in future social policy. There are now 14 SIBs in the UK with another about to launch. These are operating across a variety of policy areas including youth unemployment, homelessness, children in care, reoffending, and adoption, building on innovative work by a wide range of civil servants from the Department for Work and Pensions (DWP), the Department for Communities and Local Government (DCLG), and MoJ as well as public servants from local authorities. There is also growing interest around the world, with SIBs launched recently in both the US and Australia, and being explored in Canada, Israel, Germany, and South Korea. London Homelessness Social Impact BondThe London Homelessness SIB, commissioned by the Greater London Authority (GLA) with funding from the Department for Communities and Local Government, began operations in November 2012. It will run for three years. The GLA has commissioned homelessness charities St Mungo’s and Thames Reach to deliver frontline services to 831 entrenched rough sleepers in London. Social investors, including CAF Venturesome, Big Issue Invest and the Orp Foundation are providing the up-front funding. Investors will receive a return on their investment, in the form of outcomes payments from the GLA, only once specific outcomes are achieved. These include a reduction in the numbers of rough sleepers, moving people into settled accommodation, reducing A&E admissions, and getting people into employment. Department for Work and Pensions Innovation FundThe Innovation Fund is a £30 million pilot programme developed by DWP to test new delivery models to support up to 17,000 disadvantaged young people over three years. It is a targeted and preventative programme aimed at re-engaging disadvantaged young people in education or training, improving their employability and reducing their longer-term dependency on benefits. The Innovation Fund was commissioned by DWP via open competition. Payments are made on a results basis against a number of agreed outcomes. These include improved behaviour, school attendance, educational qualifications and employment opportunities. Ten SIBs have been launched across the UK through the Innovation Fund, with social investors including Big Society Capital (a social investment bank set up by Government in 2012 to grow the social investment market) and the Private Equity Foundation (a charity providing finance and expertise to organisations working with vulnerable young people) providing the up-front capital. While initial results from the Peterborough prison SIB are promising and there is increasing interest in developing more SIBs, they are a new and, ultimately, unproven tool. This means that they can be difficult, time consuming and expensive to set up. For commissioners, transaction costs for SIBs are high and, while these should reduce as SIBs become larger and more commonplace, there is concern among some commentators that they will never be low enough to make SIBs a viable mainstream delivery model. Gaining buy-in for a SIB from finance, legal and procurement teams is also tricky and takes time, while accessing the data needed to accurately measure outcomes can be a significant barrier. Experience and understanding developed from early SIBs should, over time, help address the first of these issues, while there is broader work ongoing across Government to make data and data sharing easier. It can also be difficult, and in some cases impossible for those developing a SIB to secure agreement to contribute to outcomes payments from other parts of the public sector which will benefit from the outcomes and savings generated by a SIB. This is something that the Civil Service still needs to address if more SIBs in complex areas are to get off the ground. Equally, there are barriers for investors considering investing in a SIB. There is a lack of clarity on potential returns and limited understanding of the level of risk associated with an investment in a SIB. While this hasn’t deterred social investors so far, the lack of clarity around risk and return coupled with the small size of the market has meant that mainstream investors have not yet been prepared to invest in a SIB. For SIBs to reach significant scale mainstream investment will be key. Greater clarity on the returns delivered by SIBs will come with time, although it is difficult to predict whether this will be enough to attract mainstream investors at scale. The Centre for Social Impact Bonds was set up in the Cabinet Office late in 2012 to tackle some of the barriers to developing SIBs. It is a small team of civil servants and sector experts, with a mix of skills and expertise that reflects the nature of the SIB market. This includes an understanding of Government, knowledge of social investment and financial services, and experience working with local authorities, social enterprises and charities delivering public services. First, in increasing awareness and understanding of SIBs across the Civil Service and beyond. Learning resources developed by the Centre for SIBs and others are disseminated through reports, seminars, workshops, blogs and online resources such as the SIB Knowledge Box. Second, in helping to reduce transaction and set-up costs. Experience suggests that the time and resources required to develop a SIB can be prohibitive because there are few precedents to follow. The Centre has developed a standard template SIB contract to reduce the legal costs of setting up a SIB, and is looking at other areas where standardised models could help. Third, in helping SIB developers estimate cross-cutting benefits. Making data publicly available about the costs to Government of providing specific public services (for example the cost of an arrest, or the cost of a week in care for a child) can help build a viable business case for a SIB. Finally, supporting individual SIB developers with hands-on strategic advice and analytical support, and making contacts with other SIB developers and Government departments. The Centre for SIBs also aims to address the difficulty of multiple spending ‘silos’ in central and local Government, where organisational structures and budgets that focus on specific policy areas make it difficult for policy makers and commissioners to tackle issues that cut across numerous policy areas. The £20 million Social Outcomes Fund (SOF) provides top-up money where no single commissioner can justify making all of the outcomes payments, but where the wider savings across Government mean that a SIB is value for money. To date, the SOF has agreed to provide top-up outcome payments to two SIBs, one developed by the Consortium for Voluntary Adoption Agencies (CVAA) and Baker Tilly focusing on the adoption of hard-to-place children, and one commissioned by Manchester City Council to support young people in care. Manchester Children in Care Social Impact BondThe Manchester Children in Care SIB, commissioned by Manchester City Council (MCC), aims to move at least 95 children aged 11-14 with behavioural and emotional issues from local authority residential care to more stable, family-based placements. The up-front costs of the programme will be funded by social investors who will receive outcome payments based on the number of children moved from residential care, as well as improved school attendance, better behaviour and wider wellbeing. The SOF has committed to contribute up to nine percent of the outcomes payments. There is growing support available for SIBs outside Government: from investors, grant funders, and experienced SIB developers. In July the Big Lottery Fund (BLF) launched the £40 million Commissioning Better Outcomes fund (CBO). This sits alongside the SOF, with one point of entry into both funds, to pay for a portion of outcomes payments for SIBs in complex areas. Social Finance also provides support to commissioners, funded by BLF, to develop early stage SIB proposals; and the £3 million BLF technical assistance fund provides grants of up to £150,000 to help commissioners develop a full business case for a SIB. The growing SIB market also includes social investors willing and able to provide the up-front investment. The Bridges Ventures Social Impact Bond Fund is a £14 million fund launched in April 2013 with investment from Big Society Capital alongside Omidyar Network (a US philanthropic investment firm set up to scale social innovation) and Panahpur (a UK charitable trust committed to supporting the development of the social investment market). It will make investments of up to £3 million in social enterprises and charities to deliver outcomes-funded interventions such as SIBs. The Bridges Ventures SIB Fund is the first of its kind in the world. Early evidence suggests that SIBs present a real opportunity to open up public services to a diverse provider base that can increase innovation and improve outcomes in complex areas. The Centre for SIBs wants to enable more policy makers and commissioners across Government to use them. You can find out more through the Centre for SIBs website or by emailing directly – sibs@cabinet-office.gsi.gov.uk.